Someone once said that, “Too much of anything is not good for you”. This person has clearly not binged on doughnuts and coffee. Krispy Kreme has been giving people a sugar high since the 1930’s. Quite commendable I’d say. Their presence in India has been quite a hit across multiple locations in Bangalore, and have now decided to launch the ‘Krispy Lessons’ campaign on Instagram. Using their popularity on Instagram, Krispy Kreme wants to enhance the audience engagement on this platform considering it has been relatively the least exploited form of social media today. The idea was to promote this campaign for the Teacher’s Day with ‘Krispy Lessons’ that give people something to scribble down on paper and smile about with a Krispy Kreme coffee or doughnut in the background. The intention of this campaign was to allow people to share how Krispy Kreme’s many varied products can change the outlook of life’s problems. All this by means of small video clip that records the person scribbling down a catchy saying or thought with a Krispy Kreme product right next to the paper. This campaign is all about how a ‘Krispy Lesson’ could be derived from a cup of freshly brewed coffee or a soft glazed doughnut. Creating catchy lines that go with the item about to be consumed by the customer helps to give emphasis to the video clip. 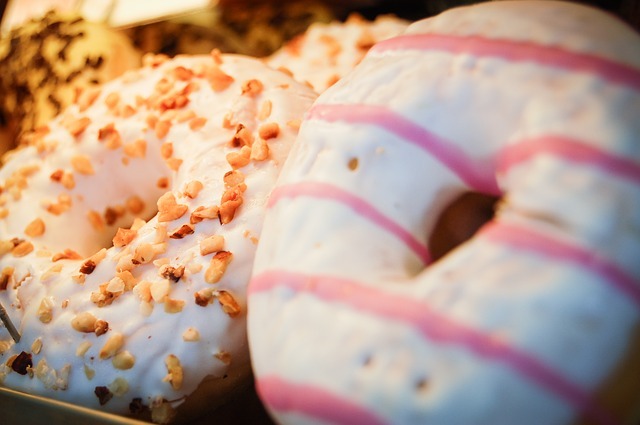 For example, ‘For a smooth journey to the top, it is important to face the crunch!’ – The doughnut name: ‘Almond All Over’. Using Instagram’s ‘Hyperlapse’ the agency responsible for this campaign has made what would have been an ordinary social media campaign into something that is quirky yet innovative. Lasting just three days, this campaign ran from September the 3rd to 5th September, 2014. 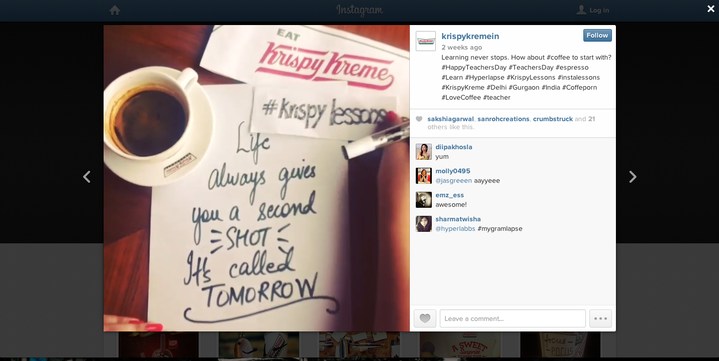 Encouraging people all along to post their videos on the Krispy Kreme India page on Instagram. People love being philosophical. Giving them a chance to make their own quirky motivational lines is like sugar powdering an ant. Not to forget, enabling them to put this up on Instagram where other people actually view them. Enjoying a hot cup of coffee and filling your bloodsteam with a sugar overdose with one of those delectable doughnuts and writing down a line you’ve always wanted to say. Nothing better than that feeling. Generates a lot of interest and gets a lot of fans active on the page. Makes for great reading too, with a keen curiosity as to what people have actually posted on these short clips. Everyone loves their teachers. From pre-school to college, there’s so many that have helped us along the way. Most people draw inspiration from them too. Giving back a little ‘gyaan’ through a short clip is almost like giving back to them some of the great advice they’ve supplied us with over the years. Coming up with quirky lines that make you look a percentage of how smart your teachers were gives you great accomplishment. Not to mention a lot of pride. Perhaps the only thing wrong that could potentially have been wrong at all was that it was too short in duration. With just about three days to have been a part of it, people may have been left cringing for more. A brilliant campaign no doubt that is innovative too, I have a feeling the fans and loyalists would have loved for a longer duration to put up their thoughts. I think this is a brilliant campaign that has brought to light Krispy Kreme’s idea of giving back to teachers on Teacher’s Day with their krispy lessons that not only promote their products but give people a chance to air their own interpretations of each product.